A captivating story of God's never-ending love and overwhelming grace. Love. We all crave it. More importantly we all need it. Without it, we end up in life or death situations or in a string of horrible relationships. Love's Bullet chronicles Maureen Hager's rise from an emotionless, dysfunctional family to finding the love she sought. But first she endured years of heartache and pain. Numerous failed relationships sent her deeper into a world without love. A second marriage landed her in an outlaw motorcycle gang. Finally, she'd found a home with a group of people who understood and she thought loved her. Until two bullets from a M16 tore apart her life. The victim of a rival gang attack, she lay for months in a hospital bed abandoned by her abusive husband and with little or no reason to live. Yet, she did. Her father took Hager home to recover. There, she heard the gospel from an old friend who had recently come to faith. 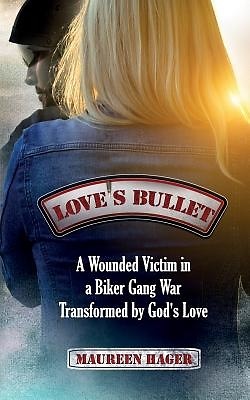 Love's Bullet shows the depth of God's redemptive love for those who seek Him. And live for Him, no matter how troubled their past.